It's Superbowl weekend and while the focus is on football, we tend to let Dads have their time with the big screen enjoying the game and fellowship. Dad works hard, supports the family and is the backbone of many families. Being the backbone, doesn't mean he's always in the background. The more involved a dad is, the more successful his children are. A father's influence can determine a child's social life, academic achievement, and future achievements. A whopping eighty-six percent of dads spend more time with their children today than their own fathers did with them, but a majority of dads (7 out of 10) also reported that they could use tips on how to be a better parent, according to a national survey conducted by the Ad Council. Children with involved, loving fathers are significantly more likely to do well in school, have healthy self-esteem, exhibit empathy and pro-social behavior, and avoid high-risk behaviors such as drug use, truancy, and criminal activity compared to children who have uninvolved fathers. I can relate to this with my own children. My ex-husband was very abusive towards me and when it came to the kids he was never there. They shut down and became distant. When the kids and I left I remarried and my current husband adopted both kids. He coaches my son's baseball team and spends time with our daughter teaching her softball and defense. Both kids have made a dramatic turn around. They are happy, social and active. 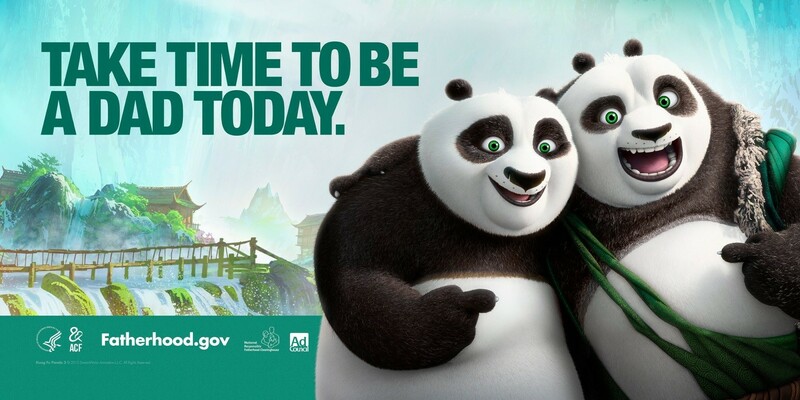 DreamWorks Animation donated their time, talent and resources for this campaign, which features footage and characters from the Kung Fu Panda 3 film. In the upcoming film, Po, the franchise protagonist, reunites with his long-lost birth father. The story highlights the special relationship between father and son and shows the unique challenges that Po is able to overcome with the love and support of his father. Visit www.fatherhood.gov and http://www.adcouncil.org/ to learn more about the fatherhood movement.